Sometimes it feels like there are days, weeks, and even years filled of problems. Nothing seems to go right. We face home repairs, car breakdowns, family arguments, and financial woes. We have to overcome injuries, sicknesses and other health problems, death, family dysfunction, and separation. There are just times in life when it feels like the world is literally standing in our way. Sailing the seas in the 1800s or earlier was a dangerous and daunting task. These journeys often took a great deal of time and resulted in sickness and sometimes death. One of the worst voyages was from the Mediterranean Sea to the Red Sea. 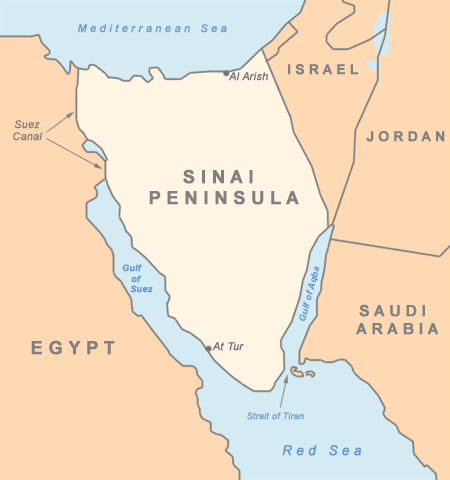 Even though they are very close together, a little chunk of land called the Sinai Peninsula stood in the way. So, one would have to sail all the way around Africa. In 1832, a man by the name of Ferdinand de Lesseps was sailing to Egypt when people in his crew became one of the many ships struck with sickness. Everyone on the ship was quarantined. While in quarantine, Ferdinand de Lesseps was sent books by a friend. These books, combined with his current situation and the tough reality of sailing, sparked an idea. Ferdinand de Lesseps decided to make a canal in-between the Mediterranean Sea and the Red Sea. 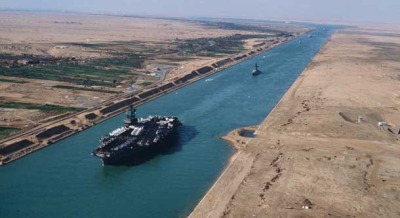 By 1869, the Suez Canal was completed. This canal dramatically reduced the danger and sailing time between the two seas and opened up a whole new world of opportunities (See Picture Below). I appreciate the sermon Neal gave last night. He talked about Paul’s “thorn in the flesh” and applied to our own difficulties. Though we don’t know what Paul’s “thorn” was (sickness, temptation, enemies? ), the key was how Paul dealt with this. In Scripture, people like Paul and Job both stood close to God and used the difficulties in their life to mature, grow, and help others. Sometimes it feels like the world is standing in our way when we face temptations, health problems, and other difficulties. For Ferdinand de Lesseps, the world literally stood in his way (the Sinai Peninsula), but he used this problem to grow and develop something that has benefited the entire world. I don’t know what kind of problems you are facing in your life; I only know my own. But we must ask ourselves, how are we going to respond to our “thorns in the flesh”? Will we give up and become angry, bitter, and depressed? Or will we use these problems to grow, mature, and help others? How we respond to our “thorns” is up to each of us. How will you respond?